The most talked about skateboarding move in the history of this extreme sport used to be the 900. Tony Hawk first landed the aerial maneuver in 1999, and it made him a household name. On a half-pipe, the skater spins 900 degrees in the air. That's two-and-a-half rotations! But what about three complete spins? It was once thought to be an impossible trick, but in 2012, 12-year old skater Tom Schaar pulled off the unimaginable when he landed a 1080! Looks like Tony's got some competition! 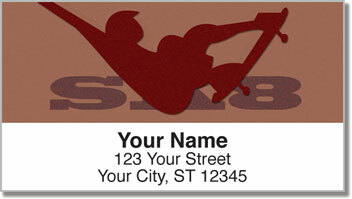 Skateboarding Address Labels from CheckAdvantage celebrate a sport that keeps pushing the limits! 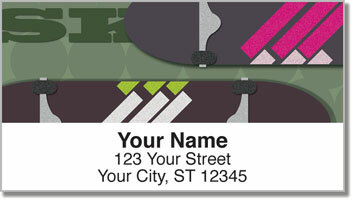 Using them will turn preparing your outgoing mail into an easy trick. 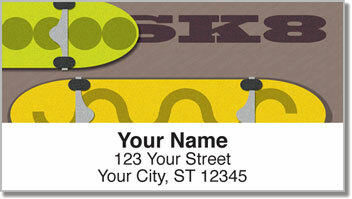 Just peel and place them on every envelope thanks to the self-adhesive backing. 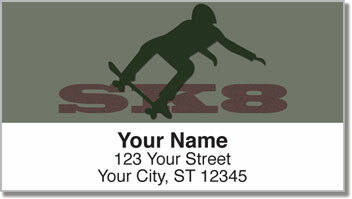 Get your own Skateboarding Address Labels now! Order them with matching personal checks.